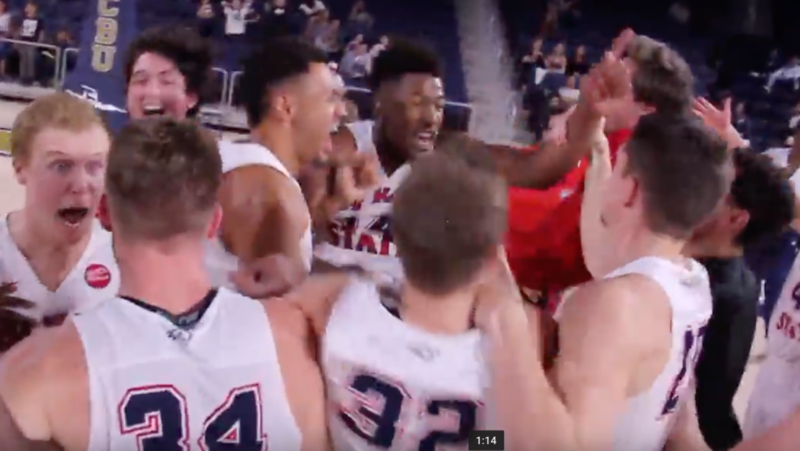 RIVERSIDE, Calif. – With its monstrous win streak very much in jeopardy and the PacWest Tournament championship game slipping away, Dixie State needed a hero. Fortunately, the Trailblazers have two. 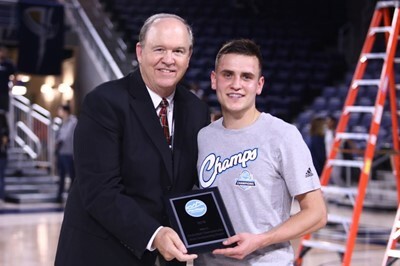 Senior guards Trevor Hill and Brandon Simister combined for 47 points and Dixie State rallied from 17 points down to overtake Cal Baptist and win the PWC championship game 66-64 Saturday night at the Events Center, CBU’s home arena. Simister led the charge with 29 points, hitting 8 of 12 field goals and all nine of his free throws in the game. Hill finished with 18 points and he scored eight straight of his team’s points late in the game to turn a 56-56 tie into a 64-59 lead with 1:53 left on the clock. But the comeback started much earlier. DSU, which has now won 17 straight games, trailed Cal Baptist 34-17 after a 3-pointer by Lancer Matt Hubbard with 4:06 left in the first half. Simister had a pair of free throws and a 3-pointer and fellow Desert Hills star Quincy Mathews scored on back-to-back possessions to shave nine points off that huge CBU lead at the 1:57 mark of the first half. After a bucket by CBU’s Gabe Taylor, Simister closed the first half with two more perfect free throws to make it 36-28 at intermission. Dixie State still trailed 51-43 midway through the second half when it put together another run. Simister started it by hitting all three free throws after being fouled on a 3-pointer attempt. Hill then rebounded a Lancers miss and went coast-to-coast and got the hoop and the harm. His three-point play cut it to 51-49 with 9:26 left in the game. Hill then picked the pocket of CBU’s Cory Lange and threw it out ahead to Simister, who laid it in to tie the game at 51-51 with 9:01 left to play. It was 56-all after a tip-in by Kyler Nielson with 6:12 left in the game. The next four minutes would belong to Hill. His twisting up-and-under move made it 58-56 and he outraced the defense for a layup after getting a defensive rebound with 4:51 to go. Cal Baptist cut it to 60-59 on a trey by Lange, but Hill put Dixie State ahead by three at 62-59 with an offensive rebound and put back with 2:38 left on the clock. DSU then gained a five-point advantage when Isaiah Clark rebounded a CBU miss and Hill converted in the lane once again. That made it 64-59 with 1:53 to go. At 64-61, Cal Baptist missed two free throws with 11 seconds to go. Simister rebounded the second miss after the ball was tipped outside. He was fouled with six seconds left and iced the game with his eighth and ninth consecutive free throws to make it 66-61. The Lancers made a meaningless 3-pointer at the buzzer for the final margin. The PacWest Tournament’s Most Outstanding Player was Simister. Perhaps his biggest play of the game came on the defensive end, chasing down that long rebound on the final possession to secure the victory. Dixie State, which improves to 23-6 with the win and gains the PacWest automatic bid to the NCAA Tournament, was a stellar 15 of 18 from the line as a team (83 percent) and had just six turnovers in the game. The Lancers were only 9 for 17 from the line (53 percent) and turned the ball over 13 times, including a pair of unforced errors in the final four minutes. On Sunday, both teams will discover what awaits them at the NCAA West Regional. 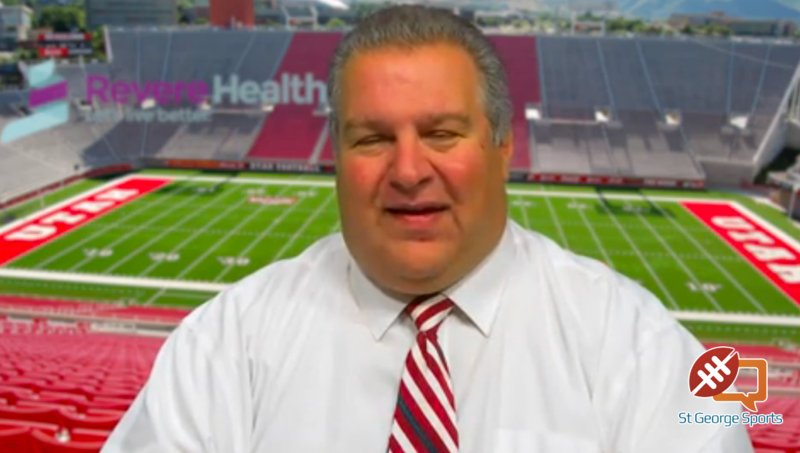 Dixie State was No. 4 in the latest rankings, while California Baptist was at No. 2.